KSRealityBites: Fresh vegetables aren't better than Frozen ones! Fresh vegetables aren't better than Frozen ones! According to a new study by the scientists at the Institute of Food Research, claims that frozen vegetables are more nutritious than the fresh vegetables. The research was carried out by the Institute on behalf of Birds Eye, the frozen food manufacturer. 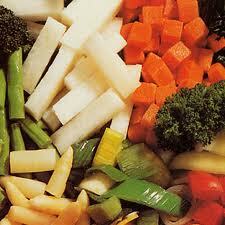 Frozen vegetables 're the commercially packaged & available at the super markets. These 're packaged in plastic bags or boxes. Vegetable like spinach, corn, green peas, etc., & 're known to 've an advantage o'er the fresh vegetables available in the market. The scientists claim that vegetables which 're frozen soon after being picked up 've more nutrients sealed in.The nutrients in the fresh vegetables start deteriorating once picked up & when they 're eaten, the nutritional value is less. They stay fresh longer when kept in freezer. They are nutritionally better than the out of season imported fresh vegetables.